If the load cables come into contact with each other and short-circuit the generator, the generator windings could be damaged by excessive current unless the generator windings and load cables are protected by a circuit breaker. The circuit breaker "breaks" or interrupts the circuit anytime there is a short circuit or overload condition in the load cables. One large load, consuming an amount of power at or near the maximum power output of the generator, could theoretically overload the generator in the event of a fault. In this case, one circuit breaker could trip the circuit and protect both the generator and the load. But small-load conductors connected directly to the larger generator load cables could likely burn up without drawing enough current to cause the circuit breaker of the generator set to open the circuit. In the interest of safe operation of load circuit conductors and safety of area personnel, you must use properly sized overcurrent devices (circuit breakers or fuses). The generator load cables are terminated at a type of distribution bus bar from which one or more overcurrent protective devices are connected. Current through each of the overcurrent devices is limited by the overcurrent rating or setting of the device. In this way power from the generator may be safely distributed through protected conductors to the various connected loads. A panelboard includes buses and automatic overcurrent protective devices placed in a cabinet or cutout box and mounted in (flush) or against (surface) a wall or partition. The panelboard is accessible only from the front. A panelboard serves the purpose mentioned above for the distribution of electric power. When you connect the generator load to the panelboard, be careful to match the cable markings to the panelboard terminals. The same phase relationship should be maintained throughout the wiring system from the generator to the load. You may see terminals marked with numbers, such as L1, L2, L3, and L0 (fig. 3-12, view A) or the letters and symbols A0, B0, C0, and N (fig. 3-12, view B). Wire in different parts of the system may be marked with numbered, lettered, or colored tape. (The color sequence is black, red, blue, and white.) Either way, the phase sequence is the same. You may have to "ring out" (identify) unmarked cables or conductors in the conduit (fig. 3-12, view C) before connecting them to the power source or load. This identification process can be accomplished in any one of several ways. You may use a bell and battery, buzzer and battery, or ohmmeter, for example. 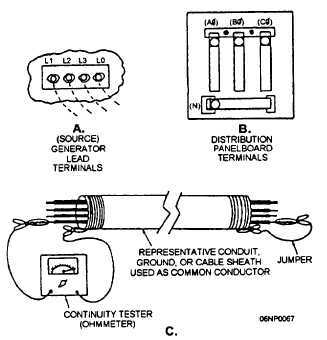 Any of these devices may be used to check for continuity through each conductor to ground (a conduit, for example). After a conductor is identified, it is then marked. Figure 3-12. - Conductor identification.